Jean-Christophe Nothias (JCN): Last year, a research by Amnesty International has revealed the alarming impact that abuse and harassment on social media are having on women. Nearly a quarter (23%) of all women surveyed in the poll (by IPSOS MORI) said they experienced online abuse or harassment at least once, ranging from 16% in Italy to 33% in the US. Could you tell us more about the specifics of India in terms of OVAW (Online Violence Against Women)? Asmita Basu (Amnesty International India): In recent years, online violence, harassment and abuse against women have become rampant in India. In 2016, Feminism In India, a digital platform, published a survey in which over half the respondents reported facing online abuse or harassment. Recently, a national daily, as part of an anti-trolling campaign, gathered a week’s worth of tweets sent to four prominent Indian women. Out of these, Barkha Dutt received 3,020 abusive tweets in one week, and Rana Ayyub received 2,582 abusive tweets, often accompanied with Islamophobic comments. Student leaders like Shehla Rashid and actors like Swara Bhaskar have faced horrific online abuse for expressing their opinions online. My own colleagues in Amnesty have received threats and abuse simply for speaking their minds on issues such as the Rohingya crisis. These issues are exacerbated when authorities fail to take effective and immediate action against such abuse. Of the women surveyed by Feminism in India who reported harassment to the police, for instance, only one in ten said they had received a helpful response. The National Crime Records Bureau data indicates that more than 12,000 incidents of cybercrimes were reported in 2016. Nearly the same number of cybercrimes which had not yet been investigated were carried forward from previous years. All this has fed into the creation of what is virtually a culture of online violence and abuse against women in India. JCN: Was there a coordinated response by Amnesty International at a global level, and global scale? What was Amnesty India’s approach? Asmita Basu: We plan to soon launch a global campaign on the issue of online violence against women, which will call on people across countries to take action. JCN: When did you first think about organising the one day #ConcertWithACause? Was it on the organisers’ request? Asmita Basu: Amnesty International has a long history of working with artists to amplify the message of human rights. As a part of a global program called Art for Amnesty, artists like Angelina Jolie, Ed Sheeran, Bono and others have taken a stand on various campaign initiatives. Amnesty India in October began an initiative called “Rumble” in association with The Humming Tree. The collaboration was deepened when the opportunity to participate in Backdoors arose. The artists who work with The Humming Tree have been supportive of the cause of ending Gender Based Violence. JCN: What metrics do you plan to look at to measure the impact of the campaign, knowing that Amnesty relies a lot on citizen and volunteers to push for human rights? Can you give us some background and perspective for Amnesty International India’s journey? 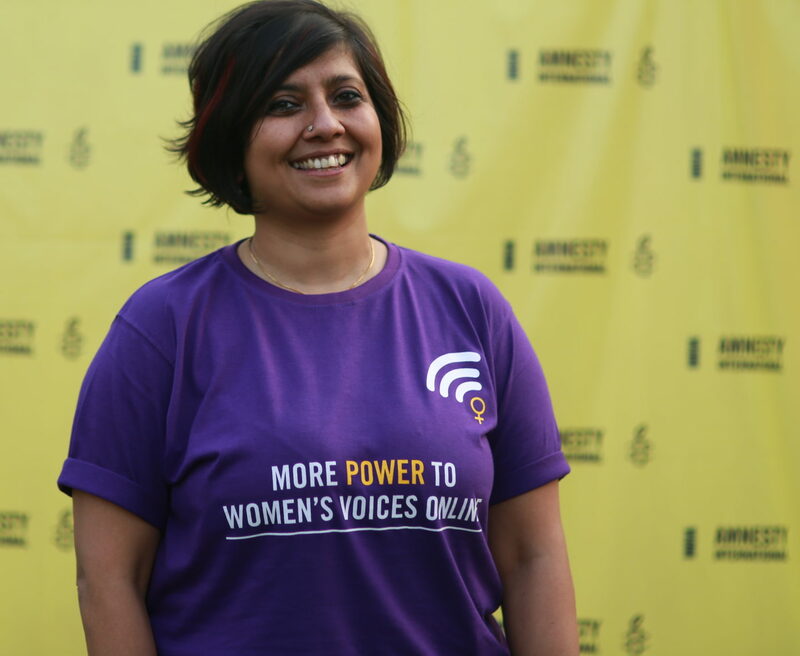 Asmita Basu: Amnesty International India is part of the global Amnesty movement that speaks out with one voice without compromise or fear to help protect human rights. We have mobilized millions of people in India to take action on a range of human rights issues, ranging from justice for war crimes in Sri Lanka to accountability for the 1984 Sikh massacre to the Rohingya refugee crisis. Backdoors is an opportunity for us to reach out to thousands of people and inspire them to take action to end online violence against women. This is an extension of the work that we have already been doing on women’s rights and gender-based violence. Through this campaign we plan to reach out to women from all walks of life who use social media. We intend to collaborate closely with organisations who have been working on the issue to raise awareness of what constitutes OVAW, and how survivors can report online abuse. We will also campaign to ensure that social media platforms enforce their own standards on online abuse and harassment of women. JCN: India is a complex and immense country with different faiths, different states, different mentalities. How does that fit into one Festival? Asmita Basu: This festival is only one of many initiatives in our campaign to end online violence against women, which affects women of different faiths and backgrounds across India. Millions of women will become new internet users every year in India, so the scale of this issue is only likely to increase. Also, music and art have always been powerful partners in the fight for justice because they have the ability to stir something deep within us. Since the 1980s, Amnesty International has brought art and activism together, uniting people from different backgrounds, faiths, religion in the pursuit of human rights for everyone, everywhere. We hope that through this music festival, we will be able to inspire more people to stand up against gender-based online violence. JCN: What will be the next steps for the campaigning #OVAW during 2018? Asmita Basu: We are launching a campaign on 8 March 2018 on International Women’s rights day. The campaign will focus on building awareness of online violence against women and holding social media platforms accountable to end abuses. JCN: There are long time fighting organisations in India, in regard to feminism. How do you plan to cooperate with them? How to select them and make sure they will stay embedded with #OVAW? Asmita Basu: We are already in touch with a number of organizations who are actively working on the issue of online violence against women. Their work and commitment to the cause is established, and we look forward to establishing stronger ties with them and collectively addressing the menace of online violence against women.